If you build it, they will come. 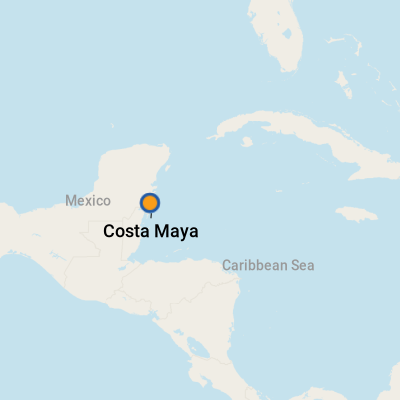 Costa Maya, located on a peninsula along Mexico's Caribbean coast, about 100 miles south of Playa del Carmen, feels like a private island created from scratch expressly for cruisers. That's because it was; developers created the port terminal/faux village complex not far from the Belize border solely to woo cruise lines, and everything -- from the manmade malecon, a beachfront pedestrian path in nearby Mahahual, to the beach club used for shore excursions -- has been created with passengers in mind. Beyond that, the folks who created Costa Maya also invested in and remade Mahahual (also known as Majahual), a one-time fishing village of 200 people that's about a 30-minute walk or $5 cab ride away. An attractive malecon anchors a row of seaside hotels, restaurants, dive shops and beach clubs that serve fresh ceviche and offer water activities along lovely white sand beaches with shallow surf (perfect for families). Although development is restricted to low-rise buildings, Mahahual's growth has attracted a small group of entrepreneurs, including a sizable Italian community, interested in making the town the "next Tulum." For travelers who just want to get into the "don't worry, be happy" mindset, the lure of the area's beach clubs can pretty much consume the day. Those who want to venture further have intriguing options, too. The region is home to some lesser-known (but still important) Mayan ruins. 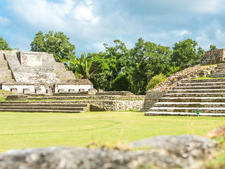 The site most cruise passengers come here to see is Chacchoben, a city dating to around 350 A.D.; some excursions focus solely on Mayan food and culture. Bacalar lagoon offers kayaking and swimming in the Cenote Azul, and there's also a Spanish fortress you can tour. While Costa Maya might look sleepy at a glance, there's something for everyone in this corner of the Caribbean -- and it only keeps growing. Ships dock right at Costa Maya's purpose-built facilities. While the pier is long, a free shuttle bus ferries passengers back and forth. The terminal, a faux village created solely for cruise passengers, is just steps from the dock. The pier-side complex features a number of free-to-use pools, one of which is huge with a swim-up bar; restaurants, bars and shops including the usual suspects like Diamonds International; and a small beach lined with chairs and hammocks for relaxing. 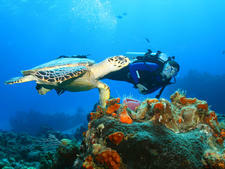 Because of the area's small size, Costa Maya and Mahahual have very little crime. The only real hassle are the vendors who walk on the beach (some beach clubs forbid them, but enforcement is lax), but a simple "no gracias" sends them along. The five-minute taxi ride into Mahahual is about $5 per person round-trip. Local buses to Mahahual pick up behind the shopping area; tickets for the $3 fare must be purchased in advance and are sold at a booth located in the same area. If you'd like to drive on your own without relying on the local buses, golf carts and Jeeps are also available for rent for around $75 per day. The currency is the Mexican peso; check www.xe.com or www.oanda.com for current exchange rates. However, many vendors will gladly accept U.S. currency. There's an ATM in the cruise port area and also in Mahahual, but you might want to have cash on hand before this stop, as few vendors take credit cards. Spanish is the official language, though English is widely spoken, as most places in the area cater to tourists. A variety of Mexican chains, such as Carlos 'n Charlies and Senor Frog's, are located within the port village. Within Mahahual, it's easy to find menus with the standard Mexican favorites, such as guacamole, chips and pico de gallo and tacos. A growing Italian population has raised the bar somewhat, however, and many of the hotels that serve food are run by Europeans, offering more sophisticated choices. In Mahahual: The shrimp tacos and seafood at Nohoch Kay, located at the far end of the Malecon, are considered the best in town. American Steve Uhl, owner of Tropicante has built a following among cruisers for the complimentary loungers he reserves ahead of time for his Tex-Mex restaurant's guests -- no minimum required. Expect the standard tacos, enchiladas and burritos. For a varied menu, including breakfast for early port calls, try Pez Quadro, the restaurant and lounge on the Malecon affiliated with 40 Canones, a hotel owned by an expat Italian. Locals and crewmembers also love Luna de Plata, which is a little removed from the strip, with a quieter beach and a full menu of Italian and seafood dishes. 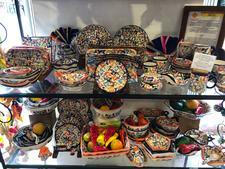 While the stores at the port sell the usual trinkets (as do the vendors on the beach, albeit at lower prices), keep your eyes out for colorful Mayan embroidery and textiles, including handkerchiefs, table runners, placemats and dresses. Try any fruity concoction sold in a yard-long plastic tumbler called, appropriately, "la yarda." If three feet of banana daiquiri or strawberry margarita doesn't float your boat, quench your thirst with a few bottles of Bohemia or Sol, the requisite beers.